Some of the most beloved flavors are inspired during the fall, and there are few better ways to enjoy the season’s best than with a group of friends and family. Get ready to wow guests with seasonal treats that invite everyone to indulge in fall flavors. Cut prosciutto into cracker-size pieces, about 1 1/2 inches in diameter. 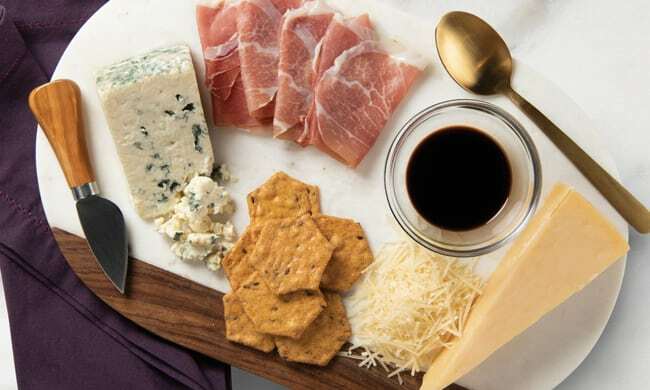 Layer gorgonzola, 1-2 pieces prosciutto and 1-2 pieces shaved Parmesan on one cracker. Drizzle lightly with vinegar. Place on wooden or slate serving platter to serve as inspiration to guests. Plate remaining prosciutto, gorgonzola, Parmesan and crackers on platter before serving and place vinegar nearby. For serving, scoop apple butter into small crock or serving vessel. Place pepitas and sage in serving dishes. Place assembled stacker on platter with crackers. Add serving dishes, if space allows, or position around platter.